Will the shock of an Ozu picture that doesn’t conform to the rules of Ozu ever wear off? Or are guns and knives in one of his films just too thrillingly novel? It’s probably good for Criterion that knowledge of Yasujirō Ozu beyond the canonical greats of Late Spring and Tokyo Story still remains rather limited after all these years, and even those who have now embraced early silent comedies such as I Was Born, But… will find surprise within the newly released Eclipse Set, “Silent Ozu: Three Crime Dramas.” Crime, you say! Ozu making films about pickpcokets, robbers, and gangsters is suddenly new, experiential territory for a director of families, aging, and acceptance of life’s tragedies. And certainly the crime scenes in the three films, Walk Cheerfully and That Night’s Wife, from 1930, and Dragnet Girl, made in 1933, are entirely exciting in novelty appeal. But who are these films novel for, and how? Perhaps analyzing the industrial approach to their creation, particularly Ozu’s relationship in Shochiku Studios, can explain how these apparent aberrations from the canonical Ozu we know now came into existence, and in fact may not be so strange after all. The three films from Ozu’s silent era represented here are not only quite bracing for their genre iconography, but especially their stylistic strategies: flurry of tracking shots, expressive compositions with jagged images, and intensely overwrought melodrama. There are elements of Ozu’s later refined style to be found, but the intense, formal system that define his period after 1949 is all but absent. Walk Cheerfully opens with a long backwards tracking shot along a number of automobiles to reveal a single man running, suddenly followed by a mass group chasing him. (This is not too far off from the opening moment of Mad Max: Fury Road, to make an impossible cinephile connection.) Dragnet Girl features a number of intensely moving, hypothetical POV shots that remind one of Hitchcock and Scorsese. Ozu was not a directorial neophyte; 1930’s Walk Cheerfully was his 14th film after becoming a director in 1927. However, it is important to place him in the context of his work at Shochiku Studios, which also housed key Japanese directors during this era, including Sadao Yamanaka and Mikio Naruse. He has more of an interest in the various American imports that had come to Japan than the other directors — one can simply note the rows of American movie posters in That Night’s Wife, or the dancing jig done by the gangsters in Walk Cheerfully as a mimic of Harold Lloyd’s similar jig in The Freshman. But more than that, Shochiku films took on a look of American films. As Daisuke Miyao notes in his work on the development of shadows in Japanese cinema through the 1920s, “Spectators in Japan were accustomed to the idea that light was more or less a neutral element in the mise-en-scene.” Much of this became noted at the kamata-cho in the early 1920s, or Kamata tone, named for Shochiku’s Kamata-based studio. These films often recreated the bright, cheerful tone that many of the filmmakers had borrowed from their viewing of films from Paramount, which held a financial interest in the studio. 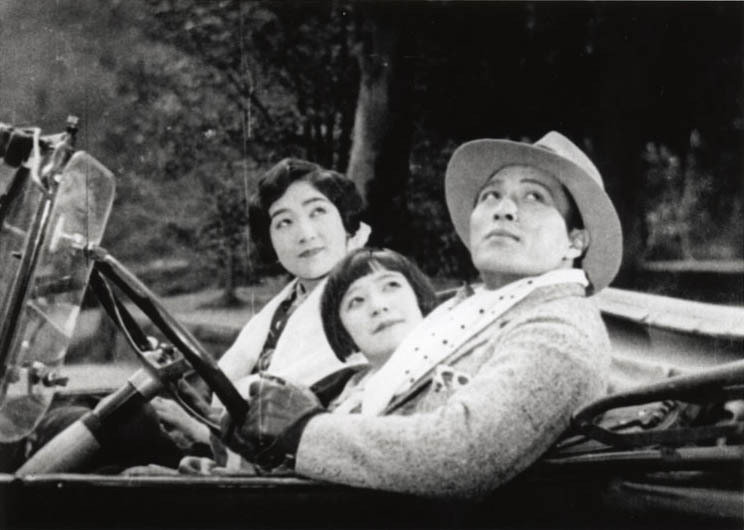 Through the 1920s, Japanese filmmakers and audiences slowly embraced the more expressive photography that began to dominate both American films and international work coming from Germany. Yuharu Atsuta, an assistant DP on Ozu’s That Night’s Wife, learned intense contrast photography by watching the German work of Karl Freund (The Last Laugh; Metropolis). Ozu’s employment of the gangster genre was also not unspoken of in the halls of Shochiku. Ozu made many types of films during this era, including child comedies, college stories, women’s melodramas, and theater troupe stories. Much of this had to due with Shochiku’s brand of exclusively working in contemporary stories, a super genre known as gendai-geki, which competed against the popular period films (jidaigeki) that Nikkatsu Studios held a grasp on. Within this super genre, Ozu’s gangsters were not so far off from the hoodlums of his college films, and both essentially worked as crossovers of the German “street film” into Japanese cinema. 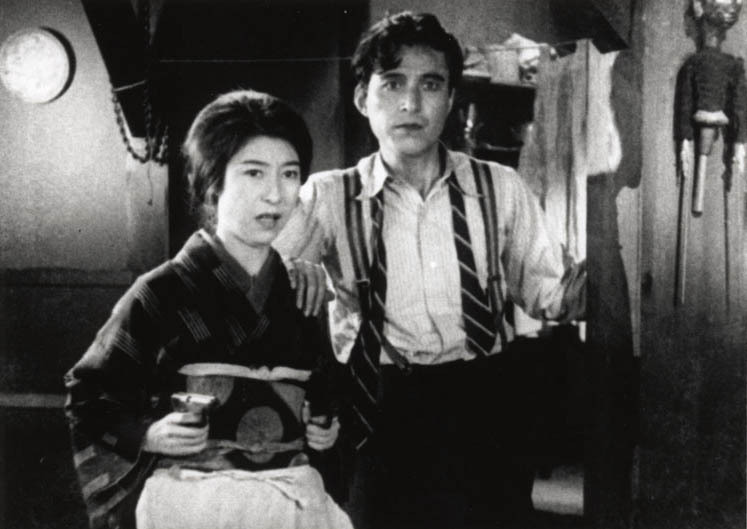 Similarly, as Miayo notes, these gangster films focus on the importance of family and tradition, staying in line with traditional narrative through lines that would not upset audiences (a similar reading can be done with the intensely avant-garde Crossways from Teinosuke Kinugasaa, whose film is ultimately a brother-sister melodrama). Even some of the college comedies feature moments of dark terror, containing expressive shadows within their imagery. Perhaps of curiosity, then, is that Ozu’s noted influences — Chaplin, Lubitsch, Lloyd — made light comedies that often used uniform lighting, filling the usual “bright and cheerful” motto of Shochiku. Does this mean the more expressive look of these films is really the work of cinematographer Hideo Mohara? Because of the major losses within the Japanese film industry over the years (not just films, but countless paper archives), it is difficult to know how Ozu may came to this expressive palette he only employed for this brief period, a moment of transition. Auteurists, however, will be eager to note the pillow shots that frequently appear in these early films. In Ozu’s late work, pillow shots of every day objects — urns, trains, empty streets — essentially act as pauses, filled with thematic richness and ultimately serving a non-narrative purpose. However, the pillow shots in these gangster films are less “poetic” and more tied directly into plot. Shots of guns, street lights, or a hanging telephone (plus a flashing advertisement for toothpaste?) all connect moments between people in direct physical ways, working more as objects of suspense. They appear less toward the end of the scene as a transition and more as a connection between material moments in a scene, even if they seem to carry thematic relations to the characters. The opening of That Night’s Wife, especially, feels like a series of intensely connected pillow shots: an empty street, a bag of money, the sudden appearance of a gun, and then the left of a handprint. This opening feels like a more minimal recreation of the famous opening to Fritz Lang’s 1928 film Spies, where individual elements create the totality of the world in a way classical continuity editing would lack the needed suspense to open the picture. But calling each of these “crime dramas” is likely to forget the second of those words, specifically the way each film recalls the American melodrama. That Night’s Wife essentially becomes a family chamber drama of its three characters in a bedroom, while Walk Cheerfully and Dragnet Girl are opposites-attract love stories. Ozu’s articulation of melodramatic attitudes can be much more jarring in comparison to his canonical work — if anything, these silent films are much louder. While the central emotional stakes in films such as An Autumn Afternoon and Early Summer are often buried, represented in small, singular gestures — a sudden burst of emotion that is quickly quelled — these silent dramas will hold on the emotional moments for minutes as characters make decisions to leave their loved ones. Featuring continual cutting, numerous physical turns by the actors, and slow, pregnant pauses, these come closest to the excess of melodrama so crucial to much of silent cinema. (It should also be noted that such turns would probably be heightened even further through the screams of a benshi narrating the drama in major metropolitan cinemas.) It thus comes as no surprise that, during the ’20s, Shochiku prized themselves on their women’s melodramas. While Ozu’s “genre” categorization never changed throughout his career, his approach to this material became more experimental when he was able to embrace silence through the art of sound. And thus the irony of appreciating these silent crime dramas arises. Because our view of film history often derives through the auteurist lens, we look at Ozu’s crime dramas and see something bold and experimental, breaking all senses of his work as we’ve come to know it. But how would Japanese audiences have received these films? Would they be seen the same way, or simply as Shochiku films “with a little more visual flair” than usual? Writing about That Night’s Wife, one Japanese critic noted that its visual style contained the “dignified appearance of Paramount films” (perhaps thinking of the work of von Sternberg). The difficulty of measuring auteurism is a losing man’s game: we begin to assign details in a singular way that forgets the importance that studio practices play in a director’s work. We forget that film artists are often crafted by their industrial limitations, and while Ozu’s style was so distinctly his, he remained a key partner in a studio where audiences often went in with genre and studio implications — the sort for which his work became, at times, simply the “house style.” It is perhaps a reminder that the understanding of film art is, first and foremost, the understanding of film economies. Silent Ozu: Three Crime Dramas is now available through The Criterion Collection.